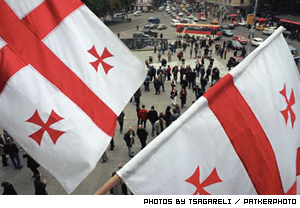 The flag of ancient Georgia flies as hopes stir for a new administration..
Georgias velvet revolution became a topic of lively discussions in public transport, in yards and around family tables of Armenia this week as people are talking about the victory of the Georgian opposition and reflecting on the defeat of Armenias opposition earlier this year. Members of Armenias National Assembly closely watched as their neighbors president was run out of office. Locally, opposition forces took courage (and some envy) from what happened in Georgia. Pro-government leaders, meanwhile, said it would be a mistake for the opposition here to draw parallels or get ideas for something similar. It gladdens and inspires us that the Georgian people headed by opposition not only didnt accept an illegitimate regime, but thanks to decisive, peaceful and insistent struggle they also freed themselves from the president, who was a symbol of that regime. Manukyan, who was an early contender in this years campaign for President of Armenia, says that Armenias opposition will surely be inspired and it will lead to actions here. We shouldnt wait for another election. Before that there must be both presidential and parliamentary elections, as continuing with this new situation and walking the same road is fatal, Manukyan says. Opposition candidate Stepan Demirchyan, who lost to President Robert Kocharyan in a runoff election in March, also sent congratulations to Georgia. Republican party leader and former Prime Minister Aram Sargsyan says Georgias oppositional victory will be felt in Armenia. Im sure that there will be a chain reaction, which will be continued in Armenia, he says. Beyond that, Sargsyan says his party and other oppositional forces were too indulgent in the first round of Armenias contested and denounced elections in February. Pro-government parties here take a different view of events to the near north. Dashnak party member Gegham Manukyan advises the opposition of Armenia to not make attempts based on what they hear coming from Georgia, adding that parallels should not be drawn between Georgias elections and Armenias. 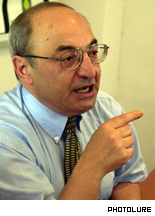 Manukyan says Georgia has hard economic and social conditions and a general political instability that makes it more vulnerable to revolt. And the overtaking of parliament and eventual resignation by President Eduard Shevardnadze, Manukyan says, were allowed by the inability of authorities to control the whole country. Somewhere in between the partisan rhetoric, leader of oppositional National Unity party Artashes Geghamyan says it is too early to say if victory for Georgias opposition is a victory for the country. We can give an estimation to the events taken place in the neighboring republic only after it will become clear for all of us what will be with Abkhazia, Adjaria and Southern Osetia. Only after solutions to those problems we will be able to tell was it for the benefit or to the detriment of the integrity of Georgia, Geghamyan says.